Car 29 is used by the chief as a first response vehicle. It carries fire extinguishers, a Fit-5, thermal camera, 4 gas meter, traffic cones and flares, medical equipment, SCBA, handtools, a tool box and books of information about our coverage area. It is also equipped with a Knox box key and radios to communicate will all local mutual aid resources. Car 29 is typically the first FD unit on a scene and allows the chief to arrive quickly and safely to provide size up information to other incoming units as well as start incident mitigation. 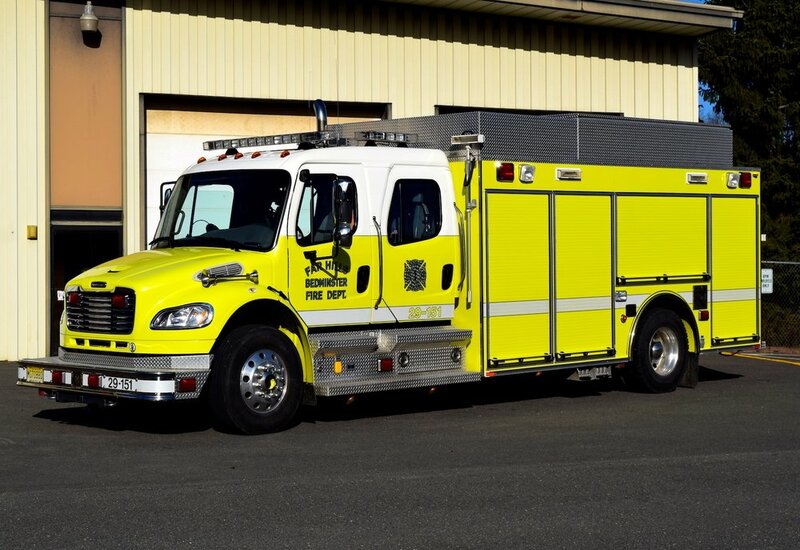 2013 Spartan ERV Rescue Pumper - 1500 GPM, 750 gallon water tank, 50 gallon class B foam tank. This engine was purchased to replace our heavily used first out 1997 Pierce Dash. As the first out apparatus for all calls in our primary coverage area this unit sees a lot of action. The driver’s side is set up for fire attack and the officer’s side is set up for motor vehicle accidents and extrications. Inside the cab is seating for six along with easy access to common hand tools and five SCBAs. Engine 29-1 is equipped with Holmatro Extrication tools, Milwaukee cordless power tools, a thermal imaging camera, multi gas meter, six preconnected handlines, and 1000 feet of supply hose. Truck 29 replaces the obsolete 1989 Hahn/Ladder Tower, Inc. 100' Tower Ladder. It carries all the necessary ground ladders, overhaul and ventilation equipment. It is also equipped with an on-board electrical generator for running power equipment and scene lighting. This vehicle is second due to all fires and emergencies. Engine 29-2 carries the same firefighting equipment as Engine 29-1. In place of rescue tools is a portable pump used to support tanker/water tender operations, as well as drafting equipment, and four lengths of flexible hard suction to utilize water from pools or streams. This unit can be manned by as many as 10 firefighters. Rescue 29 responds to all motor vehicle collisions, haz-mat incidents and major fires. This unit caries extra rescue, fire and haz-mat abatement equipment, as well as portable generators and power units for the ‘Jaws' tools.. One of the most unique features of this truck is the light tower, which raises up over 50 feet in the air to illuminate scenes where we need to work. It was built and delivered by Pierce Manufacturing of Appleton, Wisconsin in the summer of 2006. This unit is our primary water source for the response area west of Route 206 and portions of Far Hills where fire hydrants do not exist. It also responds to all motor vehicle fires, acting as the primary water source for the engines. Tanker 29 also carries a3,000 gallon portable tank for water shuttle operations when use of multiple tanker units and continuous water flow is required. Utility 29-1 carries the necessary preemptive fire equipment such as fire extinguishers, thermal imaging camera, Fit-5 knockdown extinguisher, map and preplan book, an MDT computer, SCBA, tool box, assorted hand tools, medical kit, flares, traffic cones, CO and multi-gas meters. Utility 29-2 was previously used by the Bedminster Police Department and now serves the Far Hills– Bedminster Fire Police. It carries traffic cones and flares and is used to direct traffic. The Far Hills-Bedminster Fire Department began in December, 1900 when a group of concerned men gathered to discuss the formation of a fire company to protect the fast-growing community of Far Hills and adjacent area. A constitution and by-laws were established. The necessary funds were raised and the Union Hook & Ladder Company #1 of Far Hills was formed with twenty-two charter members. On July 23rd, 1901, the group was officially incorporated as a fire company of Somerset County and of the State of New Jersey. By December of their first year, the growing membership had accomplished most of their initial objectives. A fire bell alarm code was established, alerting members as to where the location of the fire was. In 1921, Far Hills seceded from Bernards Township to become its own borough. At that time, plans were drawn up to build a new, modern firehouse. Ex-President Flomerfelt and Chief William Skillman contracted to build the project for $16,896.00. The school bell which had hung in Schley Hall, and subsequently in the old firehouse, was installed in a tower above the new building. A code was established to note the location of the fire. It was also tolled every day at twelve noon, as well as one half-hour prior to meeting. The firehouse quickly became a community center. Through the years the firehouse hosted many social occasions and recreational events. Not only were meetings of the fire company and ladies' auxiliary held there, but also Borough Council meetings from 1921 to 1967 and the first aid squad meetings from 1941 to 1971. On July 4th, 1929, Far Hills had one of its biggest fires. The first original firehouse and many other buildings were completely destroyed. Because of the proficiency of the Far Hills firefighters, a reputable fire insurance company donated $100.00 to the fire company. This donation resulted when firemen heroically saved the valuable buildings of L.V. Ludlow from almost certain destruction. Early 1934, six members traveled to Somerville one day per week for ten weeks to receive a basic course in First Aid. After the intensive program, members decided it was time to purchase new first aid equipment to be carried on the trucks. As a result of the interest by the members, the Far Hills-Bedminster First Aid Squad was incorporated as a separate entity in 1941. The first ambulance was housed in an addition built in the rear area of the Far Hills firehouse. In 1947, the Company installed an additional siren in Bedminster, which sounded simultaneously with Far Hills and aided those members residing in the Township to more quickly respond to the alarm of fire. The 1950's found the Company involved in many projects. A gala celebration commemorating the 50th Anniversary took place on August 4th, 1951 with a parade, fire company contests and demonstrations. Early in 1953, the Company purchased a new L Model Mack 750 gpm pumper, and in its constant effort in updating equipment, ordered a second Mack B Model 750 gpm pumper as well as a Willy's Jeep brush truck in 1956. New equipment was purchased for all trucks. Anthony Ferrante & Sons, Inc., of Bernardsville, outfitted the Jeep by donating and installing a 100-gallon water tank. 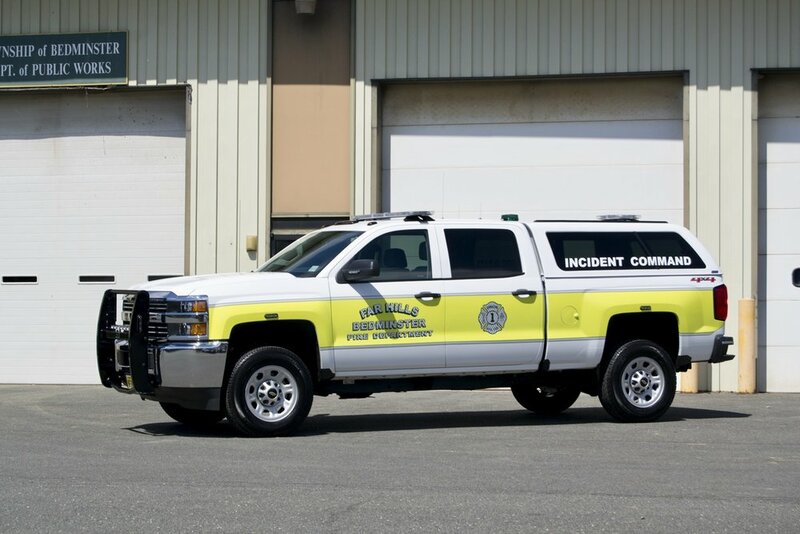 Each truck was equipped with radios and a portable radio unit, which enabled the Chief to maintain constant contact with the truck operator at all fire scenes. 1957 found the local American Legion post disbanding, and the custom of having a Memorial Day parade and appropriate services being conducted became the responsibility of the Fire Department…a tradition that is carried on to this day. Always alert, early in 1961 the Company purchased home radio receivers or “Plectrons” upon which fire and first aid calls were received, and contracted with a twenty-four hour answering service to activate the sirens and dispatch equipment. This service brought to an end the many years of faithful service rendered by the Welsh family. Also purchased was a bronze plaque dedicated to the memory of our deceased members. Twenty-two charter member's names were originally cast, and fifty-eight names appear thereon…twenty-two of whom were ex-chiefs. In the mid 1960's, the membership remodeled the second floor of the Dumont Road firehouse by installing new kitchen facilities and adding recreational facilities for the enjoyment and utilization of members and outside organizations. In 1968, working with Bedminster Township officials, plans were made to house one truck in the township garage on Hillside Avenue. In June 1969, a committee was formed to draw up plans for the purchase of a new fire apparatus, and in March 1970, a 1,000 gpm Hahn entered service. During this time, extensive renovations were made to the apparatus bay at the Far Hills firehouse, due to the size of the new apparatus. Most all of this was again done by the members – saving many dollars in man-hour labor. July 1975 found a truck committee recommending the purchase of an American LaFrance Century model 1,000 gpm pumper a, with delivery scheduled at the end of the year. This apparatus replaced the old 1953 open cab Mack that was sold to a department in Maine. It was also the first truck in the fleet to be painted in the current color scheme of white over yellow-green. The American La France served the department until 1992. The highlight of the year 1976 was the 75th anniversary of the company that was held in June of that year. A dozen surrounding departments participated in a parade that ran from the Old Research Cottrell building (now sight of Bedminster 2) to the Far Hills Fairgrounds. The department, looking to consolidate its operations in Bedminster, moved the old Engine 2, which was stationed in a bay at the Hillside Avenue Municipal building, to a new 2 bay facility built by Bedminster Township for fire department apparatus. The bays were erected along with the new town public works building. Our apparatus and equipment are currently stationed here today. The year 1983 brought additional responsibility to the department as the Hills development started to occupy its residences. At this point the population of Bedminster quickly increased, as did the call volume. Engine-1 was moved to Miller Lane along with Engine-2 to meet the growing needs of Bedminster, with Engine-3 and the brush unit remaining in Far Hills. In August of 1985, the Department purchased a used aerial device from northern New Jersey. An 85-foot FWD/Snorkel was placed in service. This marked the beginning of the Truck Company and further enhanced services along with the 3 engines already in service. 1986 started off in early March with a large explosion and fire in the Crestmont neighborhood in the Hills. A building under construction fell to a gas explosion that leveled half the structure. Due to the efforts of the department with mutual aid help from Martinsville, Green Knoll and other departments, damage was limited to area of explosion and all exposures on all sides were protected, and large loss of life was diverted through timely evacuations and carefully placed multiple master streams on the building. This was the first test for the newly acquired aerial device. The department received notoriety from the incident and landed a feature story in the July issue of “Firehouse” magazine. In 1998, citing confusion of its name, decided to officially call itself The Far Hills-Bedminster Fire Department, changing from its original name of Union Hook & Ladder Company #1. With the size of fire apparatus increasing, and the acquisition of more specialized fire fighting equipment, space in the firehouse in Bedminster was at a premium. Also, the firehouse in Far Hills cannot adequately house the current fire apparatus. The need to create a new facility was recognized. Currently, a new 5-bay facility to house all the apparatus and equipment, and combine both fire houses is in the planning stages. The new firehouse is proposed to be built in Bedminster Township, opposite of the current facility on Miller Lane. Over the past 100 years, the fire department has evolved in training, equipment and apparatus. These experiences have enabled us to provide the highest level of fire protection for our communities. We have appreciated the mutual aid we have received over the years from our surrounding communities, as well as providing assistance as far as Woodbridge, Hopewell, Mendham and Tewksbury. We have also witnessed changes in our community over the years, which present new challenges for us. Large estate homes, high-density housing, two Federal highways, two state highways, a commuter rail line and an airport present new situations for us. We continue to stand ready to handle whatever emergency is presented to us. The services we provide today, such as vehicle extrication, water rescue, hazardous material response, public assistance, and fire prevention and education continue to expand from our basic duties as firefighters.